It may come as a surprise to find that around 40% of women will have noticeable hair loss by the time they reach age 40. It can severely affect a woman’s confidence and self-esteem. Society doesn’t fully understand the problem, and the medical community tends to invest more resources into treating the male side of the condition compared to the female side. There are also diseases and medical treatments that can lead to hair loss. Whether natural aging or a health condition caused your situation, a wig or top piece may be able to help. They are safe to wear and come in a wide range of styles and colors. Some are made with heat-safe synthetic material while others are crafted from real human hair for an authentic look. Which hair piece will offer the best results for you? Should I Get a Top Piece? The top piece is intended for women who need to conceal a specific area. They provide partial coverage so you can still let your natural hair show. The top piece, or topper, is available in both synthetic and human hair with a long list of color choices. They usually clip in and blend with your real locks. If you love to wear your hair up, you’ll be happy to hear that toppers can handle ponytails. You will have to style your hair, which can take time (depending on your desired look). They tend to be lightweight as well, so your scalp doesn’t overheat. Using the clips recommended by your stylist is important. Cheap clips can damage hair. If you are uncomfortable using the clip method, you may be able to apply a top piece with tape or glue. This approach will be more labor-intensive and should be handled by a professional. Choosing the right color is also very important. Since the top piece will sit next to your real hair, it will be more obvious if it is a shade or two off. Should I Get a Wig? Wigs provide total coverage. They also come in real human hair and synthetic styles, each with a long list of color choices. 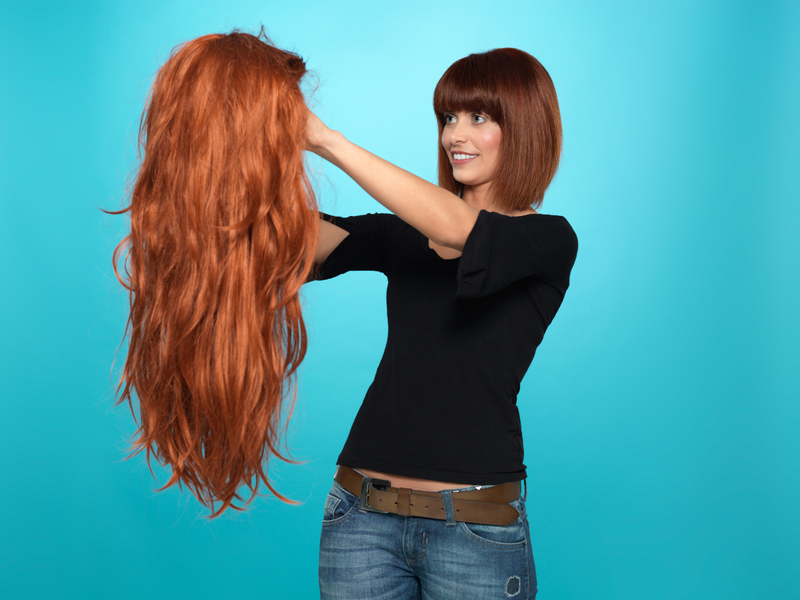 A wig will cost more than a topper, especially if you want a quality hair piece. It is well worth the investment if you need more or complete coverage. You may pay a higher price for the initial purchase, but keep in mind that you won’t have to pay for future salon visits with a wig. You will save money in the long-term that can offset some of the upfront cost. Wigs can be worn with no hair or on top of existing hair. Wigs also provide another benefit: quick and easy style changes. If you want to try a new color or look, just switch wigs. You won’t have to make any permanent changes to your existing hair and you and change back to a previous style at any time. There are some drawbacks to wearing wigs. They may cause your scalp to heat up in warm weather. They can also be challenging to wear when exercising or engaging in outdoor activities. You may feel some pressure from the added weight as well. You should always wear a cap under the wig and only wear wigs that fit properly to avoid damaging your real hair. The best way to choose the right hair piece for you is to talk to a stylist. A professional can recommend products based on your needs and styling preferences. They will be able to show you colors that match your real hair for toppers or ones that might go well with your new look for full wigs. Most importantly, you can get advice about daily wear and hair care that will help prolong the life and look of your top piece or wig. Tiffany Taylor is available to answer questions and guide you to the best hair solution for you. Call today to book a consultation for a wig or hair piece.